Isabel is trying to build herself a life in Los Angeles. It's not really working. She can play the game as well as all the other fakes...but what's the point? What is there to win? I gave this book 5 stars. 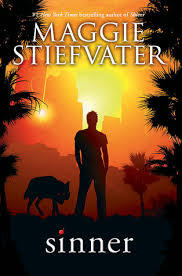 This is my favourite book by Maggie Stiefvater, also one of my favourite books of all time. I've lost count of how many times I've read this book, but let me just tell you, it's a lot. After having read the Shiver, Linger, and Forever, I was left wanting to know what happened with Isabel and Cole. When I found out this was going to be a book I was so excited. To be honest, if it had been another book about Sam and Grace I'm not sure I would have read it at all. Because it was about Isabel and Cole I ended up buying this book the day it came out, despite having obtained a very bad sunburn that day and being in incredibly bad pain. A fangirl's work is never over. Now, I might have been a bit nervous going into this book, thinking things like "What if it isn't as good as I hope?" And "What if they don't end up together?". Well thank the gods, because this book did not disappoint me in the slightest, it had everything I ever wanted while I was reading the first three books in the series. My one complaint is that the font wasn't coloured like it was in the other books. But that's more of a cosmetic issue, nothing to reflect on the actual content. In this book Cole was as Cole as ever, same with Isabel. Isabel was as Isabel as ever. Sometimes, I've noticed that in book series's when they switch to different main characters during the series, the characters are different than what they originally were from the other characters' points of view. In this book Cole and Isabel didn't lose what they were. Cole was strange, charismatic, and slightly broody, just as he always was. And Isabel was still snarky and cold, just like she always was. Neither of them lost their key characteristics. As always, I love Maggie Stiefvater's writing style. There is so much soul in what she does. She brings the world and the characters to life with her imagery and equal parts showing and telling.